Submissions for the “Intended Nationally Determined Contributions (INDC)” will be requested. In Asia, Japan has been encouraging examination of policies using the Asia-Pacific Integrated Assessment Model, as well as promoting the development of inventories and the formulation of NAMA. We have also seen the emergence of the Low Carbon Asia Research Network (LoCARNet) proposed by the Japanese Government and IGES. 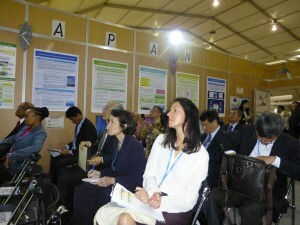 This network has facilitated activities towards realising low-carbon development in Asia, by fostering and enhancing research communities in Asia, conducting policy dialogues between researchers and policy-makers, as well as promoting information-exchange and knowledge-sharing through annual meetings. And now the integration of all this knowledge and experience will be effective in INDC preparation. This side-event at COP20 will provide an opportunity to present Japan’s collaboration with Asian countries which we hope will be useful in INDC preparation in Asia. It will also be a good chance to carry out frank exchanges on what kind of support Asia expects from Japan. Mr.Oi from MOEJ briefly explained Japan’s various activities in Asia, such as support for developing inventories by the Green house Gas Inventory Office, Japan (GIO), work on developing low-carbon society scenarios by the AIM team, and conducting knowledge-sharing through AP seminars, etc. Mr.Oi stated that Japan has been contributing in the formation of science-based mitigation policiesin Asian countries,and will continue these activities in the future. Dr.Fujino from NIES introduced the fact that the AIM team has been contributing not only to science-based policymaking in Japan,but also has been promoting the development of low-carbon scenarios in Asian countries. Dr.Fujino pointed out that AIM is an abbreviation of “Asia-Pacific Integrated Assessment Model” , but also refers to a network of researchers and experts with 20-years accumulation of knowledge. He stated that the AIM team has endeavoured to foster research capacity in Asia by encouraging researchers and experts in-country to develop their own scenarios/models with full ownership. Prof. Ho from UTM touched on collaboration with the AIM team on the Iskandar Malaysia project. stressed the importance of bridging the gap between science and policy, as well as linking policy and implementation,by drawing up action plans and promoting concrete actions towards realising low-carbon societies. He pointed out that one of the key success factors of this project would be a hybrid of a top-down approach with strong initiatives by leaders, and a bottom-up approach fostering low-carbon mind-setting through awareness-raising and environmental education. He also stated the importance of media outreach activities. Mr.Kamal from the Ministry of Environment,Cambodia,touched on mitigation activities conducted by his country. There are quite a few collaborative activities with various donors; Cambodia understands the growing importance of science-based policymaking. He mentioned that it remains a major over arching goal to develop and strengthen the capacity of researchers in-country, and to establish a mechanism to reflect research results in to policies. Also,he recognised that it is vital to develop reliable measures to develop inventories,and pointed out the need for improvement on this point. Dr.Lawin from DNPI explained that Indonesia is planning to submit its INDC in September 2015, to promote necessary coordination amongst Ministries concerned. In terms of the involvement of researchers into policymaking, DNPI has concluded MOUs with some local Universities, so that they can participate in developing mitigation plans at the sub-regional level. Mr.Hieu from DMHCC mentioned that Viet Nam is making progress with preparations to submit INDC in May 2015, in close collaboration with various donors. He said that,while Viet Nam is going ahead with concrete preparations, the country still needs to foster human resources in-country. Also, for the INDC, he stated that clear guidelines for INDC should be presented at COP20. Dr. Jakkanit from TGO introduced the Climate Change International Technical Training Centre(CITC), launched with assistance provided by JICA. Considering the growing importance of capacity development in this region,this centre has great potential to contribute to building a wide range of human resources for future science, policy and implementation, not only for Thailand but also other ASEAN countries, and to be a hub of knowledge-sharing and a core for networking in this region. Dr. Nishioka from IGES summarised the side-event: Japan has been supporting a set of processes from inventory development, low-carbon scenario development, science-based policymaking,to implementation towards realising low-carbon societies;as one of the major characteristics of its collaboration with Asian countries,Japan has attached great importance on how to strengthen ownerships by countries concerned;and through WGIA, AIM international workshops and several meetings conducted by LoCARNet, Japan has been contributing to the promotion of mutual learning and knowledge–sharing amongst Asian countries so as to achieve south-south regional cooperation. Meanwhile, speakers stated that they still need support from Japan (and other developed countries) for the basic support necessary for a low-carbon society, such as capacity development and inventories.